Inflammatory breast cancer (IBC) is an infrequent but aggressive manifestation of breast cancer, which accounts for 2–4% of all breast cancer cases but responsible for 7–10% of breast cancer-related deaths, and with a 20–30% 10-year overall survival compared with 80% for patients with non-IBC with an unordinary phenotype, whose molecular mechanisms are still largely unknown to date. Discovering and identifying novel bio-markers responsible for diagnosis and therapeutic targets is a pressing need. MicroRNAs are a class of small non-coding RNAs that are capable to post-transcriptionally regulate gene expression of genes by targeting mRNAs, exerting vital and tremendous affects in numerous malignancy-related biological processes, including cell apoptosis, metabolism, proliferation and differentiation. In this study, we review present and high-quality evidences regarding the potential applications of inflammatory breast cancer associated microRNAs for diagnosis and prognosis of this lethal disease. Breast cancer, a malignant breast neoplasm originating from breast tissues, is the cause of cancer-related mortality among women worldwide. It’s also a highly heterogeneous disease that consists of multiple subtypes with distinguishing clinical effectiveness and distinct prognosis. On the basis of the American joint committee on cancer (AJCC), inflammatory breast carcinoma (IBC) is “a clinic pathologic entity characterized by diffuse erythema and edema of the breast, often without an underlying palpable mass”, which is a rare but lethal form of primary breast neoplasm, which only accounts for 2–4% of all breast cancer cases but responsible for 7–10% of breast cancer-related deaths . The median overall survival of IBC patients is approximately 2.9y compared with 6.4y for patients with locally advanced breast cancer (LABC) , but the molecular mechanisms are still largely unknown to date [3, 4]. Even with a great deal improved therapies, including surgery, radiation, hormone therapy, anthracycline-based or herceptin-based chemotherapy and combination of these modalities, IBC patients still have relatively poor survival outcomes, which is related to its biological characters, such as lymph angiogenesis, intense angiogenesis and vasculogenesis [5–9]. IBC is known as a heterogeneous disease histomorphologically, which is also manifested in the molecular level. Some published studies about mRNA expression profiling to date have showed that transcript-heterogeneity exists in IBC as comprehensively as in non-IBC. Apart from that, the molecular subtypes established such as HER2-positive, luminal, and basal type can also be identified in IBC [10–20]. Furthermore, several previous studies have demonstrated a particular expression signature of miRNAs in IBC and non-IBC, when compared to healthy controls as well as among this two forms of breast cancer. Compared with healthy controls, serum levels of some miRNAs were obvious down-regulated in IBC, while some miRNAs were apparent over-expressed, which indicates that these miRNAs may probably be used as a new bio-marker for diagnosis or prognosis of IBC and non-IBC . MicroRNAs (miRNAs) are single-stranded small and non-coding RNAs that are responsible for regulating the gene expression post-transcriptionally. They exert their regulatory functions via sequence-specific interactions with congenetic target mRNAs, usually by binding to the 3′untranslated regions of the target mRNAs , thus stimulating target mRNAs translational repression and degradation . 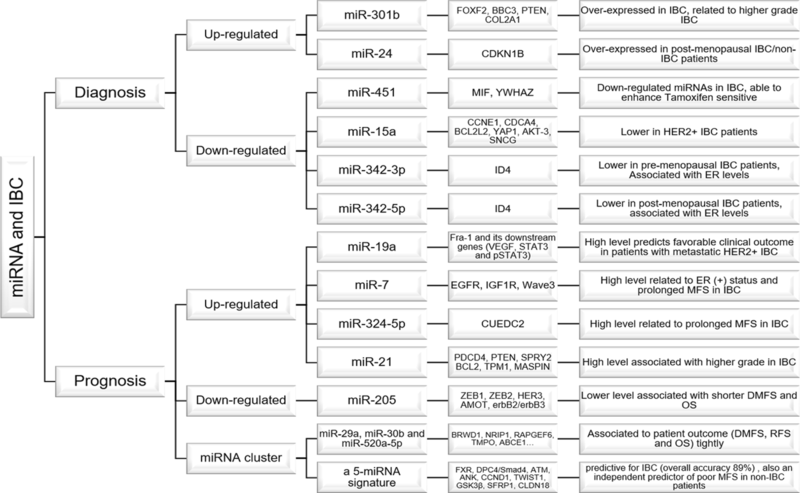 Aberrances of miRNAs expression in tumor versus normal breast tissues are in connection with the occurrence and development of neoplasm  and closely related to invasiveness , molecular subtypes  and hormone receptor status of breast cancer [27, 28]. 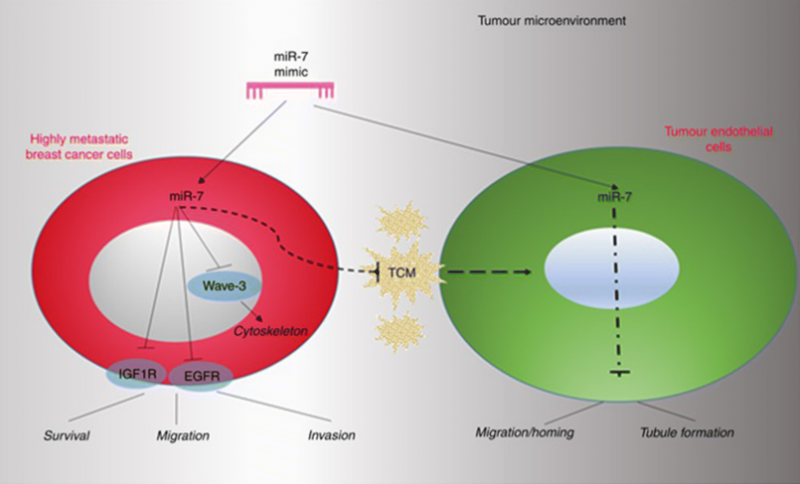 Furthermore, certain miRNAs also function as tumour oncogenes or suppressors in different cancers. For example, microRNA-133a acts as a tumour suppressor in breast cancer through targeting LASP1 . All these pathological events due to a wide array of pathological and biological processes such as apoptosis, cell proliferations and tumorigeneses resulted from dysregulated miRNA expression , accounting for the possibility of miRNAs serving as valued molecular bio-markers for diagnosis and prognosis of tumors. Increasing evidence has been shown that miRNAs hold great promise to serve as distinctive and non-invasive molecular bio-markers for tumor [31, 32], which is mainly based on the following advantages. (1) The sequences of lots of miRNAs are conserved across different species, which means subtle individual differences in the population; (2) the expression of some miRNAs is related to many diseases closely, especially in tumors, and the expression is also restricted to specific tissues or biological stages of ailments. (3) Originated from cancer tissue , miRNAs are stably existed in serum/plasma because of their strong resistance to RNase digestion as well as their protection from degradation by means of inclusion in various protein complexes or numerous membranous particles such as micro vesicles or exosomes. (4) Serum/plasma samples are available conveniently and non-invasively, and the levels of miRNAs can also be easily measured by multifarious common and mature detection technology [34, 35]. All these findings show that, as a novel, safe and non-invasive bio-marker, miRNAs will furnish considerable diagnostic and prognostic values on IBC and non-IBC diseases by restoring or antagonizing their expression [36, 37]. Only several researchers have identified the importance of miRNAs come from IBC tissue as diagnostic molecular bio-markers so far. Thus, evidence of evaluating the diagnostic effect of miRNAs in blood, other bio-fluids and primary tissues from IBC patients is considerably devoid. Given the fact that the diagnostic potential of IBC miRNAs is undiscovered and underestimated at present, it is of vital importance to perform substantial studies to identify miRNA-based bio-markers available for early diagnosis of IBC. In limited circumstances, here we concluded 5 miRNAs that is capable of being diagnostic molecular bio-marker for IBC patients which are confirmed by several previous high-quality studies (Table 1; Fig. 9). Among these 5 miRNAs, there are 3 miRNAs also relative to some specific characteristics of IBC. According to a few studies before, there are some molecular and clinicopathologic features may influence the level of miRNAs in breast cancer. For example, compared to normal breast tissues, Nassar et al. found that in post-menopausal breast cancer samples miR-155 was up-regulated, which made it a important breast cancer molecular bio-marker for postmenopausal patients. Study conducted by Hamdi et al. also indicated that, when compared with those with nulliparity, miR342-5p was up-regulated in patients who have positive parity history. For non-IBC patients, miR-335 could be an important non-IBC bio-marker for pre-menopausal patients while miR-24 for post-menopausal non-IBC patients, which would contribute to the diagnosis of early onset in non-IBC patients . When it comes to the IBC patients, previous studies have indicated that several miRNAs (such as miR-15a, miR-342-3p and miR-342-5p) were associated with a few molecular and clinicopathologic features (like Her2 status and menopausal state). Based on the study led by Lerebours et al. , miR-301b was observed highly over-expressed in IBC patients when compared to non-IBC. 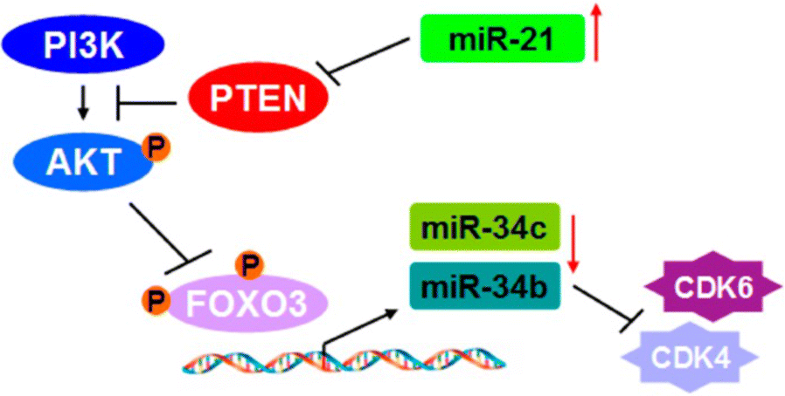 Targeting to FOXF2, BBC3, PTEN, and COL2A1, miR-301b functions in proliferation, invasion, migration and finally local recurrence as well as distant metastasis . Apart from these findings, increased miR-301 expression level was relevant to higher grade in IBC patients, while to ER(−), stage III and higher grade in non-IBC patients  (Fig. 1). miR-451 is found obviously down-regulated in IBC patients when compared to normal sera, providing credible evidence for miR-451 being considered as a new serological bio-marker for IBC, which is derived from a study led by Khouloud et al. and Hamdi et al. [21, 37]. In this regard, one possible explanation accounting for this phenomenon is that exosomes containing miR-451 are cut off 57.5-fold. Consequently, the release of exosomes is lesser extent and the level of miR-451 expression in circulation is lower in IBC patients. This might be either the result of the development progress of tumor or the cause of this lethal disease then leading to the oncogenic of IBC, for which the general mechanism is not clear to date. In addition, according to a few correlation analyses, there is no definite association between miR-451 and other miRNAs. Furthermore, mir-451 showed up an AUC of 0.783 with 80.0% specificity and 81% sensitivity in identifying the IBC patients by an average reduce of 57.5-fold compared to normal sera . According to a study conducted by Wang et al. 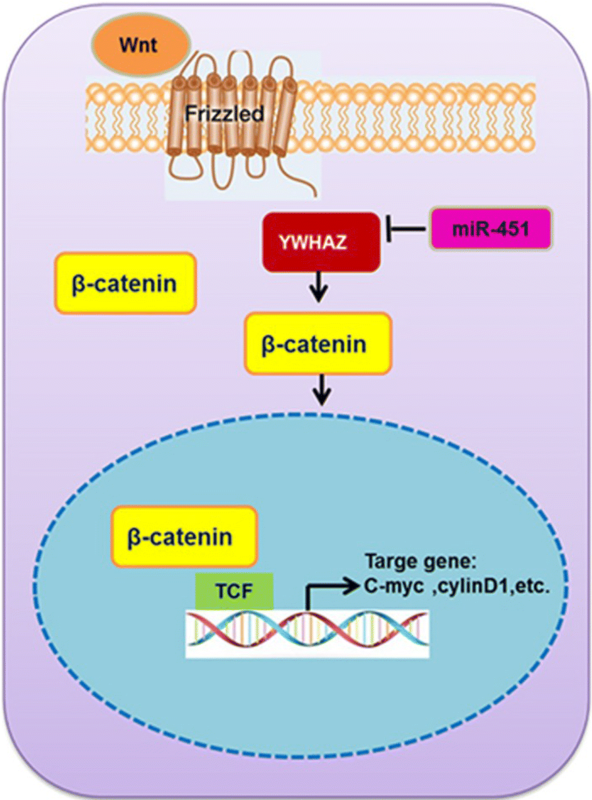 YWHAZ was identified as a direct target of miR-451, and downregulation of miR-451 is able to upregulate YWHAZ expression so that may reduce paclitaxel resistance in IBC (Fig. 2). 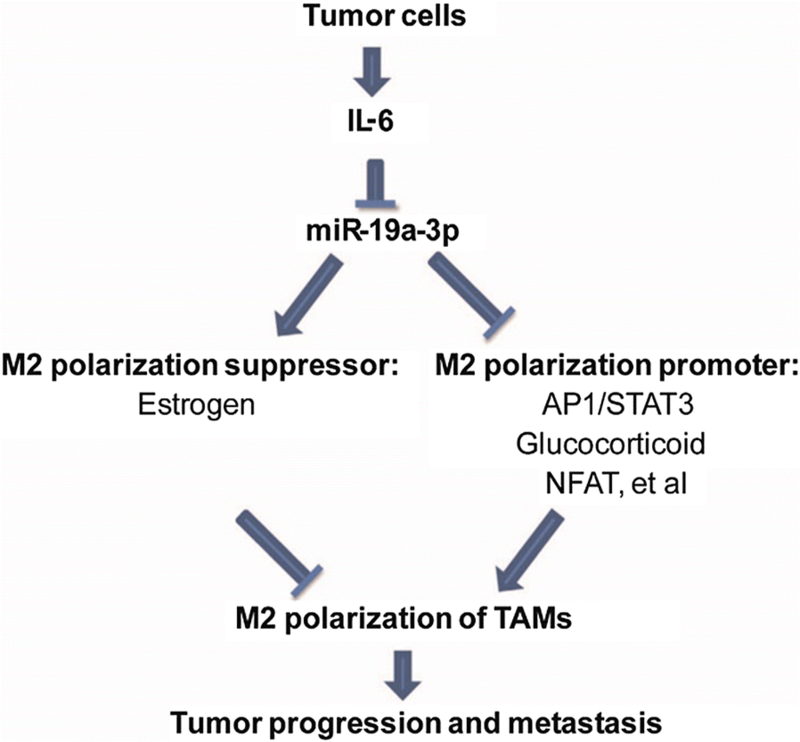 Apart from that, downregulation of miR-451a is also able to upregulate MIF expression and can increase breast cancer cell growth, invasion, and tamoxifen sensitivity, which indicated that the miR-451a/MIF pathway may also be a potential therapeutic target for breast cancer as well as IBC . Levels of miR-15a was positively and closely associated with HER2 status in IBC patients. 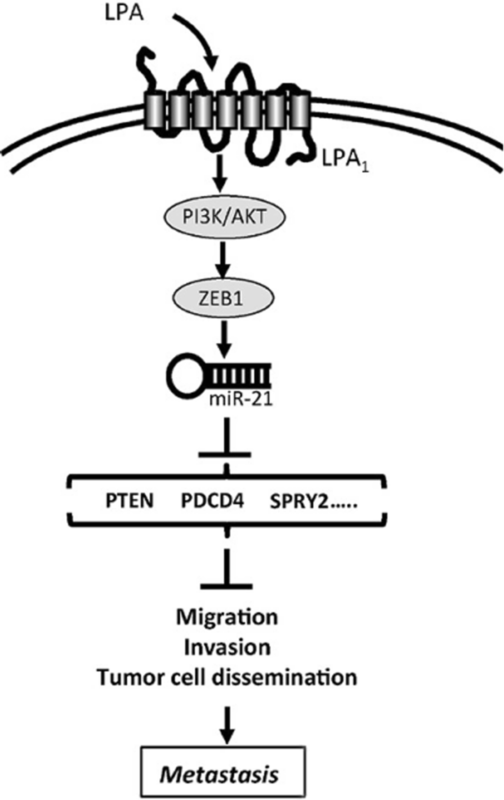 Targeting to CDCA4, BCL2L2, YAP1, AKT-3 and Cyclin E1, miR-15a has been found to significantly reduce cancer cell survival and aggressiveness (Fig. 3) . According to a few previous studies, in HER2+ IBC patients, serum expression levels of miR-15a were obviously lower than that in HER2− IBC patients, indicating that HER2/neu over-expression in Her2+ IBC patients may change expression levels of miR-15a. Consequently, hypothesis can be concluded that tumor cells that over-expressed HER2 probably make a contribution to the reductive miR-15a expression levels in Her2+ IBC patients’ serum. In view of a research conducted by Cittelly et al. they shown that a clinically momentous oncogenic isoform of HER2 called HER2Δ16 is able to suppress miR-15a. Furthermore, by means of targeting Cyclin E1 directly, miR-15a also play a major role in promoting cell apoptosis and mediating cell-cycle arrest of breast cancer, make it clear that miR-15a possesses tumor suppressive activity in a cell line of breast cancer [45, 46]. In addition, due to the discovery of HER2/neu-induced miR-15a restrain, a better understanding about how HER2/neu over-expression accelerates metastasis and invasion of IBC cells is well provided . All these connections between miR-15a and HER2 status indicate that HER-2 signalization is worthy to have a place in the regulation of miR-15a in IBC and miR-15a can be a considerable molecular bio-marker for assessing HER2 status in IBC . Unlike miR-15a, miR-342-3p and miR-342-5p have close relationship with menopausal state of IBC patients. Despite that miR-342-3p and miR-342-5p belong to the identical family, they do not notably correlate in IBC. In pre-menopausal IBC patients, plasma level of miR-342-3p was observed to be lower; while in post-menopausal IBC samples, serum miR-342-5p level was down-regulated. This finding indicating that pre/post-menopausal status may affect miR-342-3p and miR-342-5p expression levels separately. Therefore, the potential of miR-342-3p seems to be more appropriate for pre-menopausal patients while miR-342-5p for post-menopausal IBC patients . Furthermore, Crippa et al. found that miRNA-342 was significantly associated with estrogen receptor (ER) levels, and it is able to regulate BRCA1 expression through modulation of ID4 in breast cancer, which indicates its important role in diagnosis of IBC. However, to validate this hypothesis and to figure out the accurate mechanism of this pathway, more studies should be extended in the future. It is widely acknowledged that predictive bio-markers and targeted therapies are still scarce for the prognosis and treatment of IBC, which may be in agreement with the lacking for improvement of survival rates of IBC patients hitherto . Some previous studies have proposed a few characteristics of tumor that have effect on IBC prognosis, such as hormone receptors, histological grade and so on. To predict IBC prognosis more accurately, the prognostic value of miRNA has been much accounted of nowadays. For breast cancer, a number of published studies have identified a few miRNAs that is of prognostic value. Citing an example of miR-155, Roth et al. found that it is distinguished between healthy people and non-metastatic breast cancer patients through analyzing their serum samples. When it comes to the prognosis of IBC patients, several available miRNAs have also been found (Table 1; Fig. 9). According to a study conducted by Yang et al. microRNA-19a-3p can inhibit breast cancer progression and metastasis by inducing macrophage polarization through downregulated expression of Fra-1 proto-oncogene (Fig. 4). Apart from that, based on the study led by Anfossi et al. who analyzed plasma samples from IBC, non-IBC and healthy individuals, it was identified that the over-expression of miR-19a in serum was closely associated with a preferable clinical outcome in patients suffered from metastatic HER2+ IBC, which may represent a credible molecular bio-marker for prognosis of IBC patients [37, 50]. To a lesser extent, on the strength of its possible tumor-suppressing function, a high level of miR-7 was interrelated to favorable survival and ER(+) status in IBC patients. In addition, miR-7 has been speculated to inhibit the proliferation, migration and invasion of endothelial cells negatively by downregulating the expression of EGFR, IGF1R and Wave3 particularly (Fig. 5), and it is also able to suppress the homing and migration of endothelial cells to more aggressive tumor cell conditions [39, 51, 52]. Study led by Lerebours et al. showed that up-regulation of miR-324-5p was related to prolonged MFS in IBC phenotype (log rank test: p = 0.0108, HR = 4.37). Although it hasn’t been confirmed that miR-324-5p is associated with cancer samples in human, it was discovered that the oncoprotein HPV16 E5 in cervical epithelial cells could repress the expression of miR-324-5p . A study conducted by Song et al. provided evidence that sinomenine treatment suppressed breast cancer cell invasion and metastasis via regulation of the IL4/miR-324-5p/CUEDC2 axis. Besides, in neuronal tumors, the downregulation of miR-324-5p functioned in inhibiting the oncogenic Hedgehog pathway by influencing carcinogenesis and tumor cell proliferation . However, a large number of experiments are still needed to disclosure its precise mechanism. As an oncogenic miRNA, miR-21 has been confirmed to be recurrently involved in occurrence and development of tumor. This process is achieved mainly by targeting in specific tumor-suppressor genes such as PDCD4, PTEN, SPRY2 (Fig. 6) [56, 57]. Liu et al. also found miR-21-FOXO3a-miR-34b/c signaling pathway in breast cancer (Fig. 7). Consequently, an increased level of miR-21 is related to poor DFS (disease-free survival) in breast cancer , higher grade in IBC patients, as well as undesirable molecular subtypes and higher stages in non-IBC patients . The expression level of miR-205 was reported to variate from different tumors. Among the samples of bladder cancer , endometrioid adenocarcinoma  and lung cancer , miR-205 was observed to be over-expressed. While in human samples of breast cancer [63–65], melanoma  and prostate cancer , it was down-regulated. A research of 47 individuals (23 IBC and 24 non-IBC human samples) conducted by Huo et al. suggested that the low expression of miR-205 was associated with advanced breast cancer, particularly in inflammatory breast cancer. By studying cultured breast cancer cell-lines, miR-205 is capable to inhibit proliferation, invasiveness, anchorage-independent growth and clonogenic survival, which is in agreement with its functions in the process of tumor growth, invasion, and metastasis . 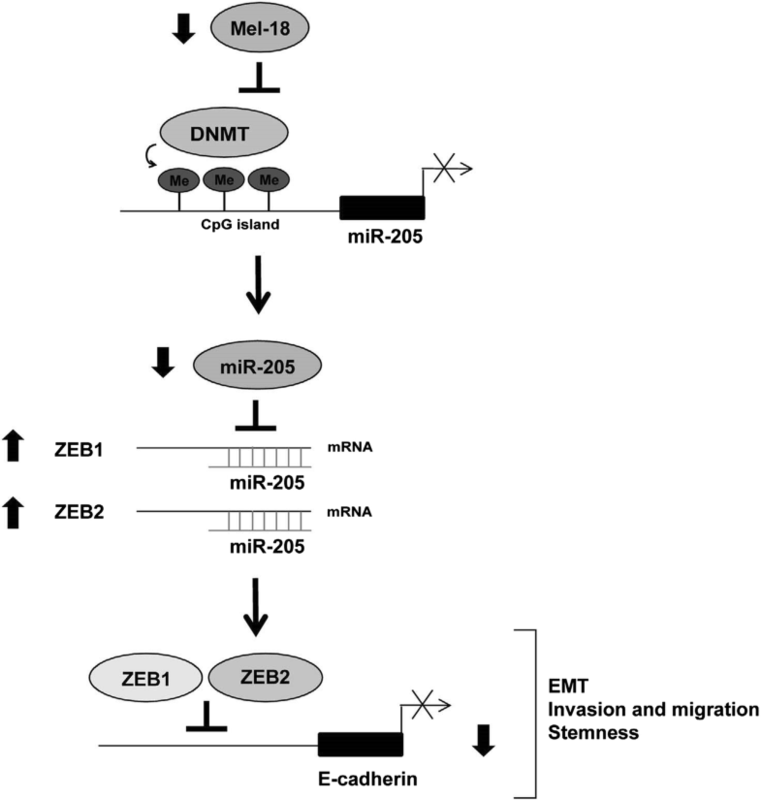 Based on studies published before, this process is achieved mainly by targeting ZEB1, ZEB2, EMT (Fig. 8) , HER3, AMOT, erbB2/erbB3 and so on [60–73]. Recent published studies have found that in mouse models, yield of miR-205 through nanoliposomes is able to make breast cancer cells more sensitive to radiation therapy . Apart from that, an antioxidant-induced expression of miR-205 can modulate epithelial–mesenchymal transition negatively, which is an significant early-step in tumor cell metastasis . Therefore, A lower expression level of miR-205 was related to worse DMFS (distant metastasis-free survival) and OS (overall survival), which indicating that miR-205 can serve as a promising prognostic bio-marker as well as a possible therapeutic target for inflammatory breast cancer. Based on the first-published integrated study of mRNA and miRNA expression in IBC, Auwera et al. discriminated a set of 13 miRNAs, whose expression is analyzed to be distinguished between IBC and non-IBC patients. Some of them were associated with a dismal disease prognosis, making these miRNAs promising molecular predict bio-markers for the IBC subtype. When compared with non-IBC, scholars found that over-expression of 6 miRNAs (miR-335, miR-337-5p, miR-451, miR-486-3p, miR-520a-5p and miR-548d-5p) was identified in the IBC patients, while 7 miRNAs (miR-15a, miR-24, miR-29a, miR-30b, miR-320, miR-342-5p and miR-432-3p) were obviously down-regulated. Among these 13 miRNAs, 3 miRNAs (miR-29a, miR-30b and miR-520a-5p) related genes were able to serve as predicted targets. According to a gene set enrichment analysis, their important enrichment in various biological processes was discriminated, which was associated closely to signal transduction and cell proliferation. For miR-29a, its target genes function in DNA methyltransferase activity mainly, which is demonstrated in lung cancer  and acute myeloid leukemia . 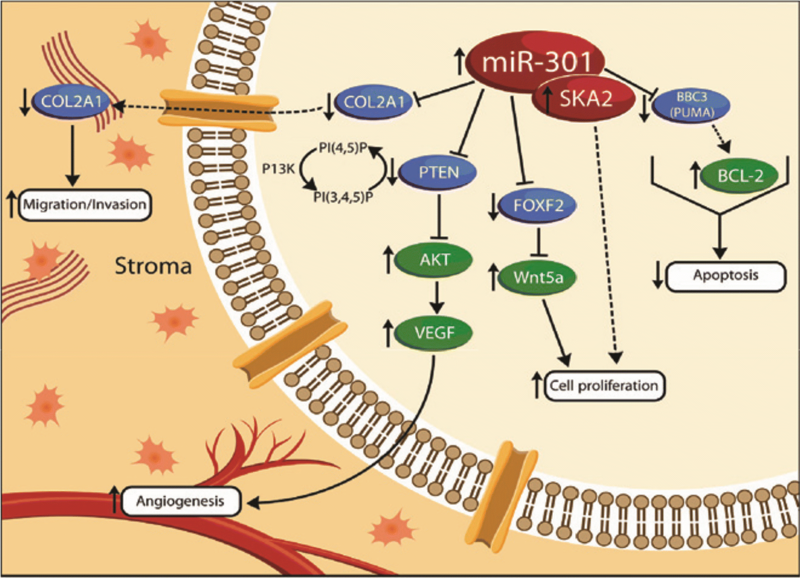 For miR-30b, its target genes were observed to be related to insulin receptor signaling, whereas target genes of miR-520a-5p proved to be interrelated to cell proliferation. The target genes of 3 miRNAs mentioned above such as BRWD1, NRIP1, RAPGEF6, TMPO, ABCE1 have close ties to patient outcome (OS, RFS and DMFS). Particularly, higher target genes levels of miR-520a-5p relevant to shorter OS, RFS and DMFS, demonstrating a significantly promising role of miR-520a-5p as a prognostic bio-marker in IBC . A minimal group of 5-miRNAs is composed of miR-421, miR-486, miR-503, miR-720 and miR-1303, which is highly predictive for IBC, exerting a tremendously remarkable discriminating value on classification performance (accuracy of 89%, p < 0.0001) . Unlike the common breast cancer biological parameters such as molecular subtype and grade, the 5-miRNAs expression signature was able to distinguish the cancer according to their potential risks for recurrence and aggressiveness, serving as a metastasis sign on the basis of tumor spreading potential. According to a classification based on 5-miRNA signature led by Lerebours et al. tumors of IBC-like group displayed clinic-pathological characteristics related to tumor aggressive behavior such as negative hormone receptors, higher histological grade and distant metastases. Furthermore, when compared with MFS between these two groups, survival analyses manifested that tumors of IBC-like group were obviously related to poor prognosis (log rank test: p50.0005). Therefore, this 5-miRNAs signature can be regarded as a promising and predictive bio-marker of IBC phenotype. Furthermore, according to a multivariate-analysis which studied all momentous prognostic factors of non-IBC, the 5-miRNAs signature was an independent predictor of unfavorable metastasis free survival . Thus, a specific gene signature resulted from these 5-miRNAs can be a predictive bio-marker for IBC, also responsible for breast cancer aggressiveness generally [74, 77]. This hypothesis was tested by Lerebours et al. in the sample of 95 non-IBC patients. In this study, this signature distinguished patients into two groups. Between the two groups, the molecular subtype and grade of each group were equivalent whereas the outcome and stage were obviously different. Despite mis-classified samples, tumors of IBC-like group revealed aggressive clinicopathological characteristic with negative hormone receptors, high histological grade and distant metastases. By comparing MFS between the two groups, Lerebours et al. discovered that IBC-like group had close ties to worse prognosis. Therefore, this 5-miRNA signature can consequently serve as predictive bio-marker of IBC phenotype. In summary, if verified in future, further studies, miR-15a, miR-342-3p, miR-342-5p and miR-15a were associated with a few clinicopathologic features (such as menopausal state and Her2 status); miR-451, miR-301b, miR-503, miR-720 and miR-486 could be considered and used as bio-markers for diagnosis of IBC; miR-19a, miR-21, miR-7, miR-205, miR-29a, miR-30b, miR-520a-5p and a 5-miRNA signature (miR-421, miR-486, miR-503, miR-720 and miR-1303) may serve as molecular bio-markers for prognosis of IBC. These findings may provide a better understanding of the miRNAs signatures and roles in IBC, identifying several novel and minimally invasive bio-markers for diagnostic and prognostic strategies by the means of targeting specific miRNAs (Fig. 9). However, there are still many limitations in this area. Firstly, most relevant literature is currently limited to studies on single or several miRNAs and there is a lack of a comprehensive network. Secondly, most of the previous studies on miRNAs are confined to detecting differences of miRNAs expression levels between IBC and non-IBC samples, thus a specific IBC signature and the mechanism have not been completely illuminated yet. More importantly, the detection methods and the sample source of miRNAs are different between these studies, making the comparability of the results is not strong enough. We still have a long way to go to translate these laboratory findings to the clinic, making miRNAs practicable bio-markers for IBC patients. Therefore, future larger studies are keenly awaited and required to verify these preliminary findings and further permit us to figure out whether and how miRNAs alterations are significantly associated to risk, onset and progression of the inflammatory breast cancer, and identify their potential as promising molecular bio-markers for early IBC diagnosis, prognostic and accelerate the progress of novel strategies for IBC therapy and prevention. Conceived and designed the study: YQ, XK. Collected the literature, wrote the manuscript: YQ, XW, XK. Collected and drew figures: YQ, JZ. Revised the manuscript: YF, XG, JW. All authors read and approved the final manuscript. We would like to thank our colleagues at the Department of Breast Surgical Oncology, National Cancer Center/National Clinical Research Center for Cancer/Cancer Hospital, Chinese Academy of Medical and Peking Union Medical College. None of the funders of this research had any influence on the design of the study, the collection, analysis and interpretation of the data, or the writing of the manuscript.